Protection for your family is a worthy cause, and La Capitale makes family insurance planning easier with their unique series of integrated insurance plans. Rather than look for plans to fit your family’s needs into, La Capitale offers all-inclusive plans, customized for each member of your family and their own stage in life. Term Insurance Series 10, 15, 20, 25, 30, or 35 year terms Ages 0 to 70 Renewable to age 85 and convertible to age 65 without a medical exam. Fixed premiums for the length chosen. 20.10 Protection 20 year term with 10-year opt-out Ages 18 to 60 Convertible without medical exam to age 65. A cash surrender option is available after 10 years. The Provider 15, 20, 25 year terms Ages 18 to 70 This plan provides monthly payments instead of a lump sum benefit for the length you have chosen. 100% Pure Protection For Life, option to stop paying after 10 years Up to age 80 Level premiums until the date you wish to stop paying. After 10 years, you have a guaranteed benefit amount. Built in critical illness benefit. 100% Pure Evolvement For Life, option to stop paying after 10 years Up to age 80 Paid-up benefit after 10 years. Premiums are lower in the first 10 years and are adjusted every 5 years thereafter. Simplified Advantage For Life Ages 40 to 80 Coverage up to $100,000 with no medical exam. Living benefit for terminal illness is included. Cash surrender value on this plan. Horizon 50+ For Life Ages 50 to 75 Up to $20,000 in coverage with only a few health questions. Available as a joint plan. Ideal for individuals with health issues. Affirmative For Life Ages 18 to 80 Up to $25,000 with no medical exam. Only four health questions. Guaranteed benefits and fixed premiums for life. Second Chance Critical Illness Insurance 15 years, to Age 65, or to age 75 Ages 0 to 60 Covers 25 critical conditions and 2 juvenile conditions. Included Best Doctors benefit provides medical aid services at no charge. Simplified Second Change 10 years or to Age 75 Ages 18 to 60 No medical exam. Covers 6 major conditions. Health Option provides a reimbursement of premiums if no claim is made. 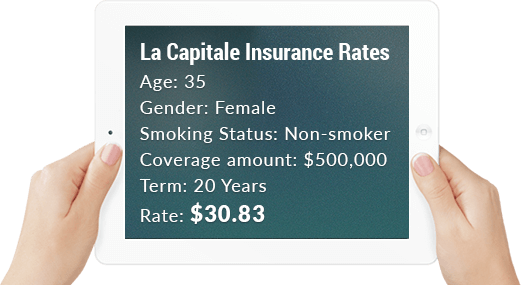 We are pleased to offer all life insurance products provided by La Capitale. For a quote on all available life insurance plans, please use our no-obligation quote provided on the right to explore your options and find the right fit for your needs.